Available in dietary supplement form, omega-3s are found naturally in certain foods. Oily fish, such as salmon and mackerel, contain the omega-3s docosahexaenoic acid (DHA) and eicosapentaenoic acid (EPA). Certain nuts, such as English walnuts, and vegetable oils (flaxseed, canola, and soybean), meanwhile, contain an omega-3 called alpha-linolenic acid (ALA). Increasing levels of DHA and EPA (either by eating fish or taking fish oil supplements) has been found to improve a number of cardiovascular disease risk factors. For example, studies show that omega-3 intake may lower cholesterol, slightly lower blood pressure, slow the progression of atherosclerosis (hardening of the arteries), and reduce risk of heart attack, stroke, and death among people with cardiovascular disease. Regular intake of fish oil supplements may reduce morning stiffness, number of swollen joints, and need for corticosteroid drugs in people with rheumatoid arthritis. Fish oil's anti-inflammatory effects may be key to its role in the treatment of rheumatoid arthritis, according to a research review published in 2003. A number of studies have shown that omega-3s may also be beneficial for people with the following health problems. However, the National Center for Complementary and Alternative Medicine cautions that more research is needed before conclusions can be drawn about the use of omega-3s in treatment of these conditions. Several population studies indicate that dietary intake of omega-3 fatty acids may lower your risk of developing certain types of cancer (including cancer of the breast, colon, and prostate). However, randomized controlled trials need to be conducted before scientists can draw any conclusions about the anti-cancer effects of omega-3s. A fishy aftertaste is a common side effect of fish oil supplements. Taking the supplement before eating may reduce the aftertaste or burps. 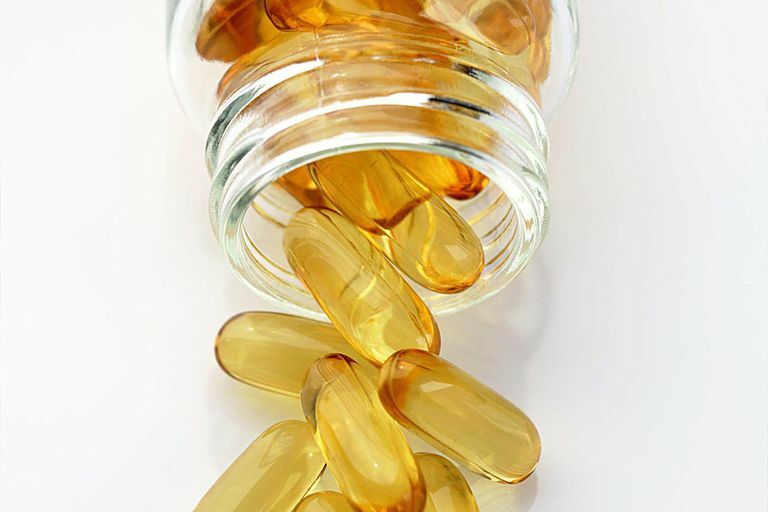 In high doses, fish oil can interact with certain medications, including anti-platelet and anti-coagulant medications and drugs used for high blood pressure. Keep in mind that supplements haven't been tested for safety and due to the fact that dietary supplements are largely unregulated, the content of some products may differ from what is specified on the product label. Also, the safety of supplements in pregnant women, nursing mothers, children, and those with medical conditions or who are taking medications has not been established. You can get additional tips on using supplements here. If you're considering the use of fish oil supplements, talk with your primary care provider first. Self-treating a condition and avoiding or delaying standard care may have serious consequences. Calviello G, Serini S, Piccioni E. "n-3 polyunsaturated fatty acids and the prevention of colorectal cancer: molecular mechanisms involved." Curr Med Chem. 2007;14(29):3059-69. Cleland LG, James MJ, Proudman SM. "The role of fish oils in the treatment of rheumatoid arthritis." Drugs. 2003;63(9):845-53.
de Deckere EA. "Possible beneficial effect of fish and fish n-3 polyunsaturated fatty acids in breast and colorectal cancer." Eur J Cancer Prev. 1999 8(3):213-21. H. Krishna Moorthy and P. Venugopal. "Strategies for prostate cancer prevention: Review of the literature." Indian J Urol. 2008 24(3): 295–302. National Center for Complementary and Alternative Medicine. "Omega-3 Supplements: An Introduction." NCCAM Publication No. D436 July 2009.